Husqvarna Toy Chainsaw - 2 sound effects - on/off switch - and moving chain ! Great toy, but not suitable for children under 3. Size is 15 inches from end to end. Sound of running chainsaw when one trigger pressed. Sound of cutting chainsaw and chain (plastic) MOVES ROUND when next trigger pressed. Uses 3 LR6 or AA Batteries 1.5V. (included). Could always give as gift to worst-enemies kids ! Write a review about "Husqvarna Boxed Toy Chainsaw"
We want to know your opinion! 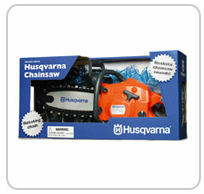 Write a review about the product “Husqvarna Boxed Toy Chainsaw” and win a National Gardening Gift Voucher of £25 ! Are you looking for the product "Husqvarna Boxed Toy Chainsaw"? We offer this product in our garden centre in Pickering, North Yorkshire. You can order the product "Husqvarna Boxed Toy Chainsaw" online or you can visit our garden centre in Pickering, North Yorkshire or for more information about the product "Husqvarna Boxed Toy Chainsaw". We look forward to seeing you soon!